Kalteng Consultants [www.kalteng.org], Kirchstockacher Weg 2, D-085635, Hoehenkirchen, Germany. Ground penetrating radar (GPR) has been applied successful to the measurement of peat depth by several authors [1, 2, 3, 4]. The ability to measure peat depth quickly and non-invasively is extremely attractive for mapping peat depth over a large area, and therefore estimating total organic carbon. 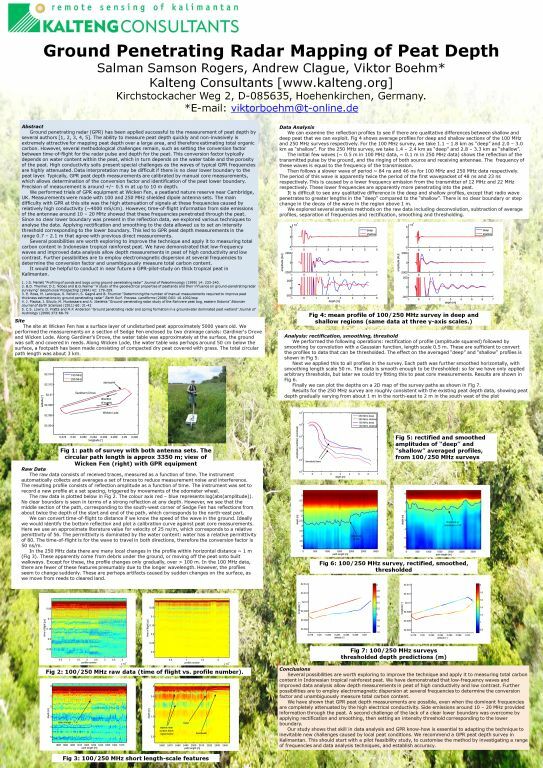 However, several methodological challenges remain, such as setting the conversion factor between time-of-flight for the radar pulse and depth for the peat. This conversion factor typically depends on water content within the peat, which in turn depends on the water table and the porosity of the peat. High conductivity soils present special challenges as the waves of typical GPR frequencies are highly attenuated. Data interpretation may be difficult if there is no clear lower boundary to the peat layer. Typically, GPR peat depth measurements are calibrated by manual core measurements, which allows determination of the conversion factor and identification of the peat lower boundary. Precision of measurement is around +/– 0.5 m at up to 10 m depth. We performed trials of GPR equipment at Wicken Fen, a peatland nature reserve near Cambridge, UK. Measurements were made with 100, 250 and 500 MHz shielded dipole antenna sets. The main difficulty with GPR at this site was the high attenuation of signals at these frequencies caused by relatively high conductivity (~4000 S/cm). However, time-of-flight information from side emissions of the antennae around 10 – 50 MHz showed that these frequencies penetrated through the peat. Since no clear lower boundary was present in the reflection data, we explored various techniques to analyse the data. Applying rectification and smoothing to the data allowed us to set an intensity threshold corresponding to the lower boundary. This led to GPR peat depth measurements in the range 0.7 – 2.1 m that agree well with core measurements. Several possibilities are worth exploring to improve the technique and apply it to measuring total carbon content in Indonesian tropical rainforest peat. We have demonstrated that low-frequency waves and improved data analysis allow depth measurements in peat of high conductivity and low contrast. Further possibilities are to employ electromagnetic dispersion at several frequencies to determine the conversion factor and unambiguously measure total carbon content. 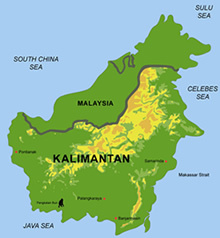 It would be helpful to conduct in near future a GPR-pilot-study on thick tropical peat in Kalimantan. J.S. Mellett “Profiling of ponds and bogs using ground-penetrating radar” Journal of Paleolimnology (1995) 14: 233-240. B.D. Theimer, D.C. Nobes and B.G.Warner “A study of the geoelectrical properties of peatlands and their influence on ground-penetrating radar surveying” Geophysical Prospecting (1994) 42: 179-209.